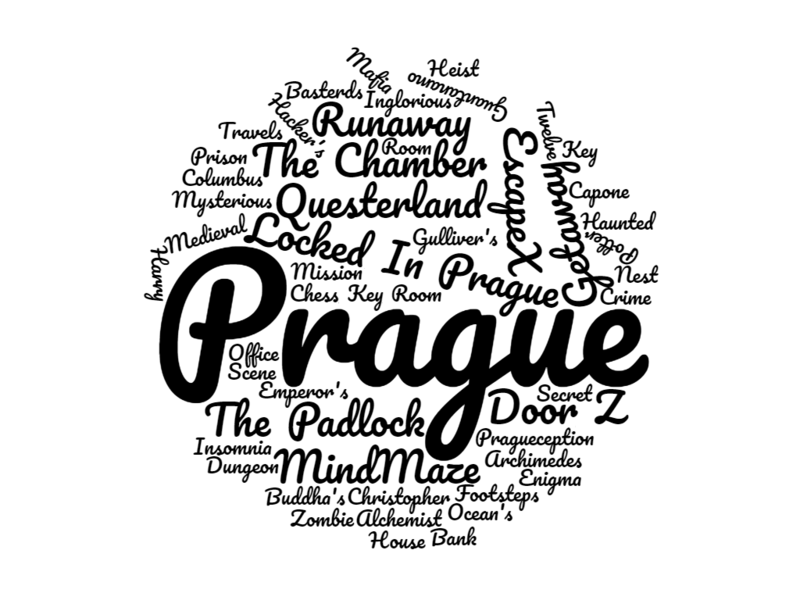 In April 2017 and October 2018, I visited Prague and played a few (OK, 38) escape games based on a combination of TripAdvisor reviews, recommendations on the Escape Room Enthusiasts’ Facebook Group and information on Solve Prague (also good for discounts in the less popular venues!). If you’re heading out to the Czech capital and want to play a game (or lots! ), then hopefully this series of posts will give you a leg-up on the research. We visited games across 15 different companies: The Chamber, Runaway, Questerland, EscapeX, Mind Maze, Locked In Prague, Chess Key Room, The Padlock, Door Z, Endorfin, Riddle Twist, Elixir Mystery, EscapeTheRoom.cz, Coderoom and Getaway. We played at pretty much all the venues we’d have liked except Reactor Escape, which we’d heard good things about but couldn’t fit into the schedule. We didn’t play at TRAP because we’ve played their games elsewhere (Blackpool, UK and Budapest), but I’ve added a few words at the end of this article for completeness. This Google map may help with locations – it has most of the escape rooms below marked on (including the individual sites in the case of companies with more than one site, which is important for the Chamber and Runaway), plus a couple of others which might be interesting. Too Long; Didn’t Read? In summary: The Chamber was the best company. Play Poltergeist, if you can cope with very scary rooms, Medieval Dungeon and Haunted House if you don’t mind something on the scary side, or Hacker’s Nest and The Emperor’s Secret if you do. Questerland is a good option for multiple games too – Zombie Apocalypse was easy and linear but very logical and flowed well, while their other three games were also good quality and all four are beautiful. EscapeX: Dream Extractors and the Padlock‘s 99-minute Mission 53 are two interesting rooms with stunning sets. Other good games: Xaverius at Riddle Twist, Chess Key and the other game at the Padlock: Cemetery. If you want something a bit different, then I’d recommend Endorfin‘s single player game, The Morgue, or Decrypt‘s The Red Room, which you have to watch the video to believe! Other general points: English speakers won’t have a problem for any of the games we played. Some were language-agnostic but most had good English translations that didn’t cause us any issues. The only language barrier for us was when asking for hints but, even then, with a couple of clarifications, we’d get the message relatively quickly. Their English was certainly a lot better than my Czech. The biggest general point was that, in Prague, clues are things you ask for. They were very rarely given to you and, even then, we were always asked if we wanted them or not. I found that very hard to handle because the difficulty of rooms varied massively – so, for example, in one game we asked for around five clues because we felt we were well behind time but then escaped with almost a third of our time remaining. As mentioned above, we’d already played both the TRAP games available in Prague so didn’t visit their venue, but we would definitely have done so otherwise. Each city has the game customised to fit the space and with some modifications, so we can’t be certain of the quality. If Blackpool’s games are anything to go by, then they’d rate at around 4 stars. Follow these links to read the UK reviews of the Bomb and Secret of the Tomb. Hi Zuzana. We obviously couldn’t visit *all* the rooms in Prague so we had to reduce to a manageable list. We were aware of your company but you weren’t specifically recommended by anyone and the 4.5 average TripAdvisor review meant you didn’t make it to our final list. Sorry – I realise that it’s a bit arbitrary but we had to be – we didn’t have enough time to visit as many games as we’d have liked. Hope you do and hope this helps. Which games did you play? I was in https://questerland.cz/ too, but what do you think? Which room was the best from these three? Ive been in their new room (they have 4 rooms now) – “star element” – i dont play these games often but this was very good. I just wanted to ask if is it worth to play this zombie apocalypse. Zombie Apocalypse was my favourite of the three I played but it was also the easiest. If you’re OK with paying for a full game but potentially getting out in half an hour then I think it’s a great choice. The magic room was fun but had some rough edges. I wouldn’t discourage people from playing but it’s not a game that I went “wow” about. I could well believe others love it though. I got frustrated in the bank over a couple of puzzles that I thought were weak so although it had a lot going for it, I came out disappointed. I think a bigger team would have changed how we felt about it though because those weak puzzles would have been easier to handle. Again, I wouldn’t dissuade you from playing but I don’t think it’s a “wow” game, pretty though it is. Which Prague room would you recommend for my mum and me to do? I have nearly 40 rooms under my belt and she would be a complete beginner. So something not completely dull for me but easy enough that we have a chance with me basically doing it all on my own. Thanks! MindMaze Alchemist strikes me as a great game for that. It feels like something you could do with relatively little help. Thanks very much. Will check it out!